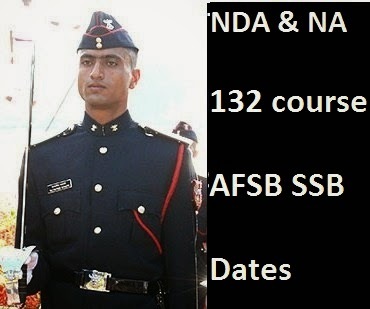 Shortlisted in NDA & NA exam II 2013 and looking for NDA 132 SSB interview dates of Air Force Selection Boards? Indian Air Force has published interview schedule for candidates who passed NDA & NA written examination. Check out AFSB dates of 132 NDA. Indian Air Force has finally uploaded the list of all shortlisted candidates for the NDA 132 course. Based on the written results of NDA & NA exam II 2013, IAF has set cut off marks to call for SSB interview. NDA & NA exam II 2013 was held by UPSC and the results were announced in November 2013. Many candidates were shortlisted by the commission for the interviews. IAF has dispatched the SSB call up letters of NDA 132 course to all selected candidates. In case any candidate who does not receive their SSB interview call letter, can take print out of the PDF provided here and report to the AFSB at given time and date. Check out AFSB call up details for 132 NDA course. Also check out 132 NDA Army SSB interview dates here. If you are about to appear in NDA 132 SSB interview in AFSBs, you should carry the following documents along with you. Candidates are advised to carry ten to fifteen passport size photos with them. Also check out Navy 10+2 Cadet Entry course and Army 10+2 TES course notification to apply for.